I posted this picture in IG few weeks ago. I have been collecting face masks as I feel like it gives instant result (even if its not for long). 1. AESOP Parsley Seed Masque - my favourite mask! Its an all rounder mask - hydrating, exfoliating and deep cleansing at the same time. When it dries, it tightens and I actually felt a tingling everytime I used this which I like. I feel like it's really working and doing its job. 2. 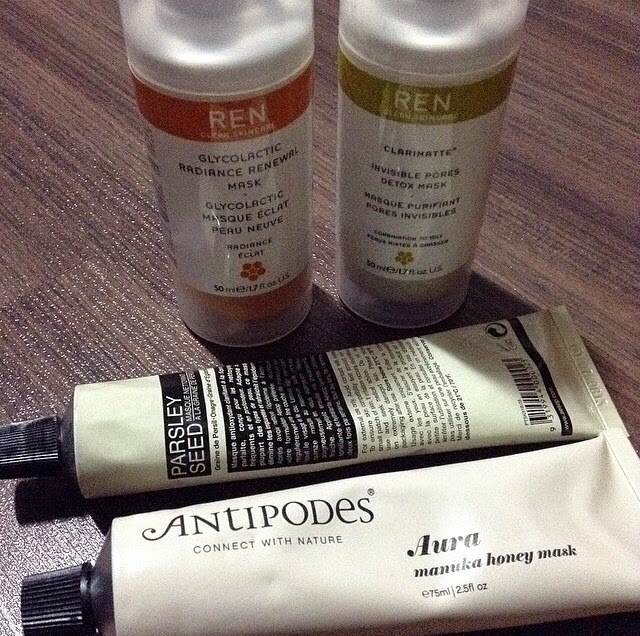 Antipodes Aura Manuka Honey mask - this is a hydrating mask. This mask however has a cream consistency, it becomes clear as the minutes go by. I like to use this whenever I feel my skin need that extra hydration. This mask is also good when there's spot trying to come out. 3. REN Invisible Pores Detox mask - this is my second favourite mask. Clay based mask that I like to use when I don't like looking at my pores, when I feel like I'm having blocked pores or when I see my pores and blackheads looking more obvious. My go to mask when my skin needs help. Not sure for how long the effect lasts, will check on that. 4. REN Glycolactic Radiance Renewal mask - whenever my skin is looking dull, this is what I used - my midweek go-to mask. The consistency of this mask is different, it's more of a gel type and does not dry like clay based mask. I have few more masks in my list though. :P So far, I'm liking all of these and since they have different functions, I try to use all of them depending to what my skin requires. I use mask 2-3 times in a week. I just love them!! !